NajwanHamidi changed some attributes to Snapshot Viewer and Extractor: Description changed. NajwanHamidi changed some attributes to Snapshot Viewer and Extractor: File 'Updated Version 1.2' changed to 'Version 1.2'. ; File 'Version 1.2' category changed. NajwanHamidi changed some attributes to Snapshot Viewer and Extractor: File 'Updated Version' changed to 'Version 1.1'. 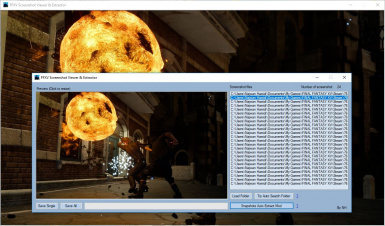 NajwanHamidi changed some attributes to Snapshot Viewer and Extractor: File 'FFXV Screenshot Viewer and Extractor' changed to 'Version 1.0'. NajwanHamidi changed some attributes to Snapshot Viewer and Extractor: File 'Updated Version' category changed. NajwanHamidi changed some attributes to Snapshot Viewer and Extractor: File 'Updated Version 1.2' category changed. NajwanHamidi changed some attributes to Snapshot Viewer and Extractor: Name changed to 'Snapshot Viewer and Extractor'. ; Description changed. ; Mod version changed to 1.2.